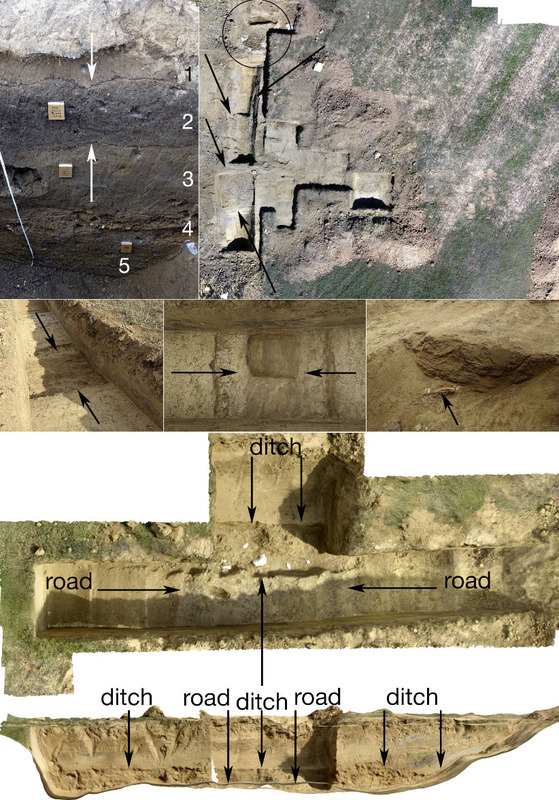 In summer of 2017 and 2018 permission was obtained to undertake two campaigns of small-scale excavation within the Rusellae sample area (Fig.1) within which a number of anomalies detected through various survey methods had been interpreted as part of a double-ditched enclosure, as a single ditch enclosure, both settlements along with a complex and wide-spreading field system (with possibly paleo-soils) and long stretch of local roads, a free-standing building and paleo-river channels along with other less specific features. The planned excavations focused on both parts of the sample area, N-E and S-W.
Test excavations were aimed at gaining a deeper insight into the dating, function and inter-relationships of the various types of anomalies by securing stratified material evidence from key points, including samples for analysis by both archaeologists and environmentalists. 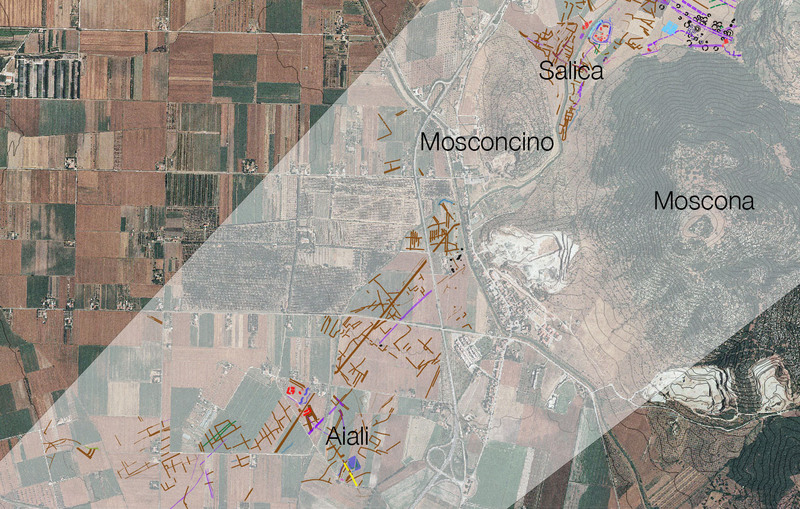 Fig.1 – In 2017 and 2018 field campains focused on Salica and Aiali areas testing mainly field systems, road systems and unknown settlement patterns. Small excavations were opened at carefully located points in the mapped geophysical data. One trench, labeled 1000 in Fig.2, extending from just beyond the outer of the two ditches and the interior of the settlement, revealed surviving paleosoils beneath the banks associated with both of the ditches, in addition to a range of cultural material including building debris as well as stratified pottery typical of the tenth to twelfth centuries C.E. Fig.2 – Section of area 1000 test excavation. The section clearly shows paleosoils 1/2 and 3 which has been dated by radiocarbon to early middle ages (2) and archaic Etruscan period (3). Further discussions will follow in specific sections. Other small-scale excavations were opened south of the settlement to test possible evidence of paleo-soils, field boundaries, roads and paleo river beds. The results obtained in sample areas 2000, 4000 and 6000 were particularly significant (Fig.3). In trench 2000 a well-defined paleo-soil 30-35 cm thick was identified approximately 70 cm below the present surface (40 cm below the bottom of the present-day plough-soil) alongthe full 30 m length of the excavation thanks to its content of organic soil and ceramic material matching that recovered from the settlement. Trench 4000 explored a section of the conjectured road system, showing it to be unexpectedly complex, especially from a structural point of view. 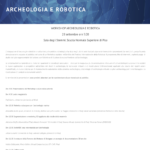 Next to the road there were identified two inhumation burials that had not been located in the previous surveys but which could now be seen belong to the age of the Lombards in this part of Italy (early VII century C.E.). Trench 5000 confirmed the identification of a field boundary while trench 6000 explored the stratigraphical relationship between one of the field boundaries and the road. In trenches 1000, 2000 and 4000, in collaboration with environmental scientists, the excavations were carried to greater depths, down to as much as 3.5 m below the present surface so as to better characterise the geomorphological and environmental transformations within the area. 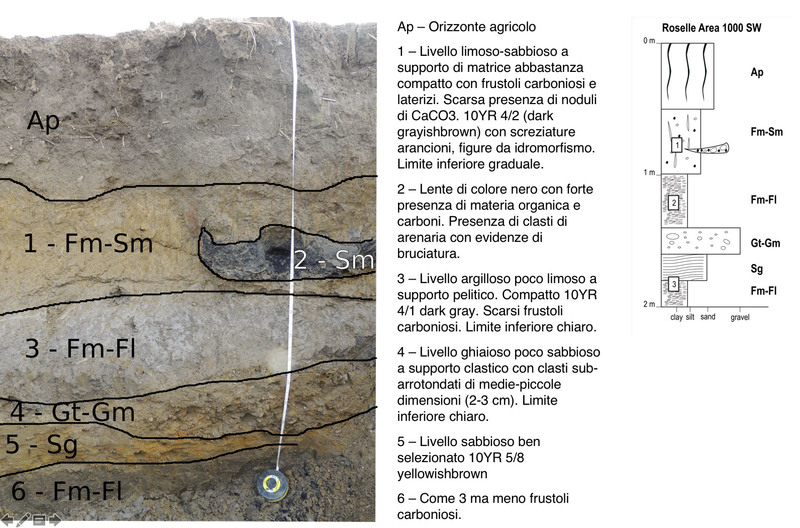 Fig.3 – Targeted small-scale excavations near Roselle in southern Tuscany. Top left: section of trench 2000 showing the clearly defined top soil (1), black paleo-soil (2), natural clay deposit mixed with other natural sediments (3,4,5); done-derived ortophoto of trench 4000 showing the complex make-up of the road (signed by black arrows) and the close proximity of the two Lombard burials (black circle); trench 5000 showing clear evidence of a ditch filled by sand deposits at the top and gravels and ceramic material at the bottom (signed by black arrows); drone-based orthophoto of trench 6000 the road where it is clearly cut by the small ditch identified in trench 5000; 3D simulation of trench 6000 showing the section of the ditch and the road apparently at different heights. The successes achieved in this short time owed much to the careful targeting of a number minimally invasive trenches aimed at answering precise questions posed on the basis of the previous survey work. 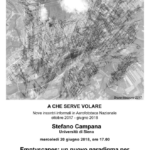 At the time of writing, late in 2018, the stratigraphical information, cultural material, soil samples and environmental evidence have provided at least provisional answers to a series of specific archaeological questions about the character and mutual relationships of critical remotely-sensed anomalies, throwing considerable light on general trends in this particular piece of landscape in historical times and enabling new hypotheses and further questions to be posed, and hopefully answered, answered by further investigation and interpretative analysis in the coming years. All of this will be discussed in the greater detail in Rusellae Test-Excavaton outcomes section.